Line of business executives who need to be fast and nimble in dynamic markets use Workboard’s app and OKRs to raise their organizations’ Velocity Quotient (VQ) – a measure of the amount of time and resource needed to achieve business results. As senior executives move to iPad as their primary device, the Workboard iPad app provides a cohesive, current and more portable picture of the business and progress to plan. Workboard Inc.’s Business Velocity Platform is used by Global 500 companies and start up unicorns alike to clarify, align and execute on business strategies fast and efficiently. Its next-generation app rates highest among customers for goal management and Objectives and Key Results (OKRs), ease of use, executive dashboards, feedback and support quality according to G2 Crowd. Workboard is led by serial entrepreneurs with a diverse team that includes rising-star Millennials and deep enterprise expertise from IBM, Oracle, NetSuite and elsewhere. The company is headquartered in Redwood City, California and backed Opus Capital, Granite Ventures, and Shea Ventures. For more information, visit www.workboard.com. Follow Workboard Inc. on twitter @workboardinc and Workboard’s CEO @day_dree for the latest on leadership and raising VQ. 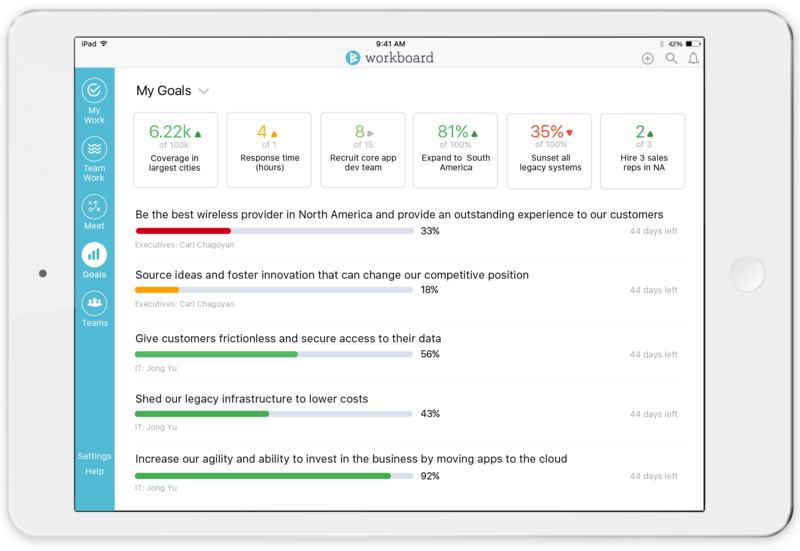 Workboard's new iPad app provides a cohesive, current and portable picture of the business and progress to plan. Let us show you how Workboard can help you clarify, align and execute on business strategies for faster, better results. Smart and fast trumps smart.